Whales are amazing communicators able to connect and coordinate with other whales over thousands of miles of ocean. The whale supports us in communicating clearly from our hearts to bridge large distances with others. Whales are also very family oriented, so the whale helps us bridge any gaps that are keeping us from connecting deeper with our loved ones. Whales support us in speaking our truth with emotion, vulnerability and power. 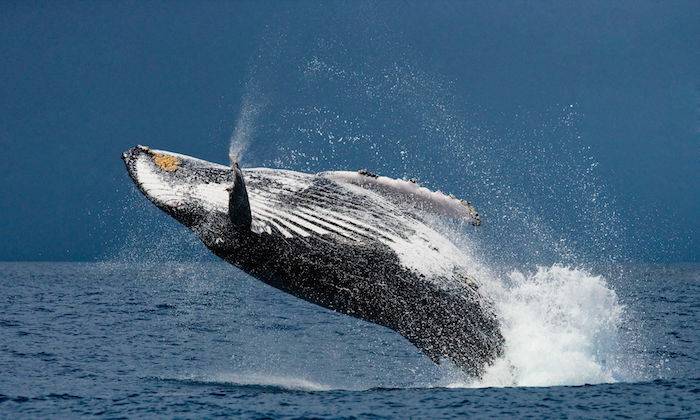 In some cultures and traditions, healthy whales swimming free are fortuitous. To see a whale unexpectedly is a sign of good luck. On the flip side, seeing or stumbling upon a diseased or beached whale is considered a bad omen that heralds ill fortune. If the whale is calling to you, then it might be time to take inventory of the emotional pressures you’re under. Just as the whale can dive into the depths of the sea and endure immense pressure, people holding the whale spirit animal also are able to endure both emotional and physical pressures. But not forever, just as the whale must surface to take new breath, so must you. If the whale is showing up this could be a powerful opportunity to remember, let go and forgive. Making space to give birth to your fullest expression and flowing creativity. 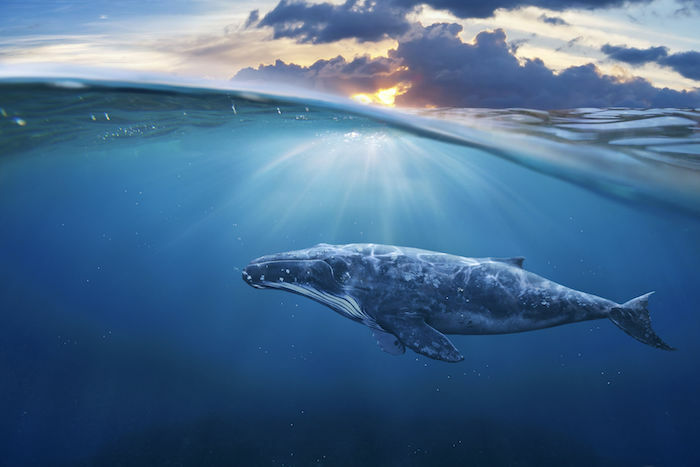 The whale is a central power animal recognized in many Native American folklore traditions that is honored and respected, especially among Native American tribes on the Pacific Coast. As a compassionate, solitary creature, the whale is closely associated with wisdom and awareness of the spiritual realm. The whale as a power animal blends the conscious and unconscious. When seen in a dream, the large mammal is offering guidance to help you become a mover and shaker who will take charge your life without hesitation. Dreaming of a whale means it is time to stand up and speak up. Whales are frequently interpreted as representing awareness and intuition. It is time to turn up the volume on that inner voice of yours and listen more closely to what it has to say. A whale’s immense size can also be symbolic of feeling overwhelmed. Maybe you have taken on too much at work, in your personal life or social obligations. It may be time to cut back some. While many traditions look to the whale animal totem as a teacher, hunting the animal is also central to some tribes and cultures. Take, for instance, the Makah Tribe in Neah Bay, Washington. Whales are central to nearly all aspects of Makah culture, from the tribe’s songs and designs to basket weaving. Hunting the power animal is considered a lesson that offers discipline and purpose to the Makah people. The hunt, which incorporates age-old ceremonies and rituals, also yields practical items, such as oil and sinew, which can come in handy during difficult times. Is The Whale Your Spirit Animal? Post your ideas and comments about the whale by using the comments below. I had this dream that I was in a very pretty part of the word sorrounded by beautiful mountains and a large river.. there’s this walkway that people have built like a village on one side of the river.. I come out from a one of the houses I see a tail. There’s a girl yelling “closer” and I look at her and get close but I don’t think the whale will get closer but it does and I see it through the water getting ready to jump up and it does and I am so happy to see it such beauty.. and it swims up close to me I talk to it and touch it but there is something wrong it has something caught around it’s neck like a bucket or like a hose with something on the top I want to help it but it won’t let me it actually snaps at me not biting me or hurting me. I leave and come back It lets someone else do it. A man idk who he is but he helps it. The whale meaning speaks about following your truth and looking closely at yourself and your words, thoughts, actions, and emotions. These things are what brought you to where you are now, and you should remove the unnecessary drama and anxiety in your life. Ive not been going through alot reciently, infact ive finally felt at peace however I’ve been dreaming im going up a huge river on a wooden sail boat, with a man i dont know but trust, the water is so blue and there are wonderful trees everywhere, but we are zig zagging up the river, he is looking for something, i dont know what but i know he needs my help, suddenly the water is turning red with the blood of the whales, they are all beached with harpoons in them, he says do you see what humans are… and then i wake up. Any ideas please? I wrote a poem once called Spirit of the Beached Whale while sitting in a boba shop in Koreatown waiting for a girl I’d just fallen in love with to get off work because I was visiting from San Francisco. I had just quit my job to leap into the unknown and met her the day after I put in a notice, and was wildly in love. I read her the poem and we both cried. I mishandled a spontaneous job offer shortly after and then the relationship got cut off before it started. A painful glimpse at true love wrought by six months bad luck. I tore my ACL in August and got fired from a campaign after that. Bad luck after bad luck. Don’t mess around with beached whales. If you see one, follow a ritual at the next new moon or full moon to rid yourself of the omens. Or go to church. Church will cleanse.